War, persecution, natural disaster and poverty force millions of people from their homes. Inspired by Pope Francis, we respond with compassion and call on governments to protect the human dignity of people on the move. We have already walked four times around the world in solidarity with our brothers and sisters. Can we make it a fifth? Take action on the refugee crisis and show your support for people forced to flee their homes. Sign our petition asking the Prime Minister to ensure that the UK takes a lead during UN refugee negotiations and organise a solidarity walk in your parish or community. Share the Journey cards - this downloadable version is available while our Shop is temporarily offline. Apologies for any inconvenience. Organising a Share the Journey walk? Use the links below or resources further along the page to help plan it. School volunteer looking for Share the Journey resources? Find out more here. Please join us in praying for our neighbours who are forced to flee their homes. Find out more about people on the move and the upcoming UN Compacts. This PDF of our cards is available for a few days while our Shop is offline. Apologies for any inconvenience. A downloadable pdf of the children's cards to be used on your walk. The cards are available from CAFOD Shop or, when the Shop is closed, from schools@cafod.org.uk. Stories to use as part of your Share the Journey walk. Celebrate your Share the Journey walk using our editable certificate. Share the Journey campaign guide for Primary schools. Everything you need to organise a walk, including a leader's script. Use this template to invite your MP along to a Share the Journey walk or event. Use this poster for organising Share the Journey walks and promoting them to your parish or community. 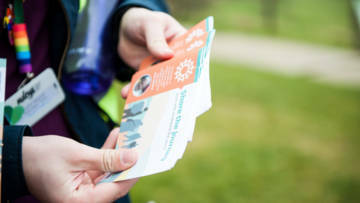 For campaigners organising multiple walks but don't need an organiser guide. A guide for people organising a Share the Journey walk in solidarity with refugees and migrants. 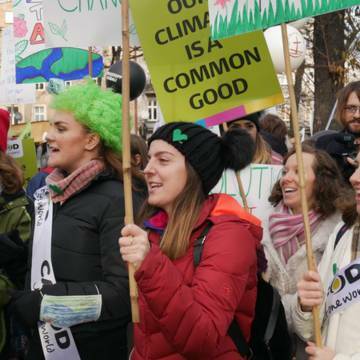 This short talk can be used in parishes and schools to promote the Share the Journey campaign and encourage others to join or plan solidarity walks in their communities. 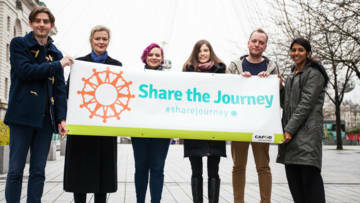 An introduction to the Caritas Share the Journey campaign, including what the campaign is calling for, case studies and key dates. Vatican guidance for governments on caring for refugees and migrants ahead of UN negotiations on Global Compacts. This was published by the Holy See's Section on Migrants and Refugees in August 2017. 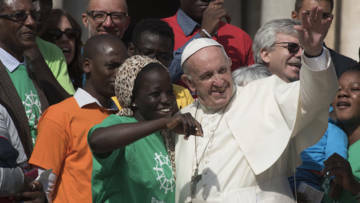 Pope Francis' message on refugees and migrants, released in August 2017. A prayer for refugees and migrants, which can be used as part of CAFOD's Share the Journey campaign. Inspired by Church teaching and the biblical tradition of welcoming the stranger, this short booklet from CAFOD and Caritas Social Action Network (CSAN) offers an insight into why and how we can care for refugees in our communities and worldwide. Encourage your parish or group to send messages of hope to refugees, using this short talk and newsletter announcement text. If you've led a pilgrimage and your group has taken action using the Lampedusa cross card, when you return the cards use this form so we know who has participated.